Chourouk Hriech is an artist thriving on multiple belongings and constant travel. Born in France of Moroccan decent, she divides her time between Morocco, France and other destinations. Hriech’s drawings reflect this confluence of inspirations and experiences, also incorporating the mythological and imaginary, resulting in the creation of social-historic frescos that depict vibrant urban improvisations. In her series Watching the Sea, the world’s oceans and cities are enveloped and entwined. As ships and liners become part of an architecture of bridges, skyscrapers and ultimately archeology, humanity encompasses all, and the horizon loops into invisibility. Hriech plays with her pen in a self-styled geometrical zone between cultures, geographies and what she describes as ‘kingdoms of opposites’, which incorporate the public and private, visible and invisible, in accessories of black and voids of white. Weaving this particular series of drawings together is the outline of a floating character, one that survey’s Hriech’s merged topographies from a swing. One can imagine that with each of his swings a new perspective, of what is essentially the same urban sprawl, bursts into life below. As imaginary as these places are, each one is a composite of recognisible building blocks that are inspired by Hriech’s shared existence between Morocco and France. Certain symbols and cultural traits are indicators of specific common histories and potentially shared futures, while other globally encountered references are repeated throughout. The result is a tangle of manmade and natural, and a condensing of time and space, where only the recurring boats in each image seem to maintain their autonomy in their international state while at sea. Between the more structured horizontals and verticals of the buildings lurk the mysteries, evils and personal attributes of each city; one is inhabited by snakes, others by cannibals and books, horns and shells, a mysterious swarm, or arrows on the wind. These strange plagues, that are reminiscent in style to those that thwarted Egypt, are distinct, while at the same time part of a patterned succession. They refer to the failures of modernity and an unfurling of future dystopia, as well as to the tension between tradition and modernity. In Hriech’s series The Nature and the Death Still Alive there are varying degrees of stress drawn between nature and man’s desire to use and abuse natural resources. 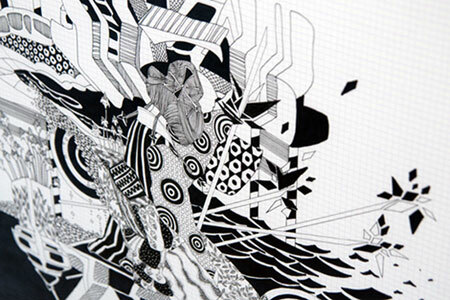 In some drawings this tension is no more than a confrontation of organically outlined foliage versus geometric lines. In others the man-made consumes the nature, until trees appear as skeletal remains, pipes and cables prevail and the remaining plants appear to have been genetically mutated. Yet in all Hriech’s drawings there are always injections of hope. In this series her spinning windmills find harmony between nature and technology, as well as bestowing a celebratory or carnivalesque air. Chourouk Hriech was featured in the New Ends, Old Beginnings exhibition.